The range of JAPA 305 firewood processors is designed for those who require easy mobility and effortless operation from their machine. The 305 model comes with a hydraulically driven chainsaw, which operate reliably and silently. The saw chain only rotates when the log is being cut. The splitting of the log is by means of a hydraulic cylinder that is activated when the saw-handle is pressed down to its lower position. 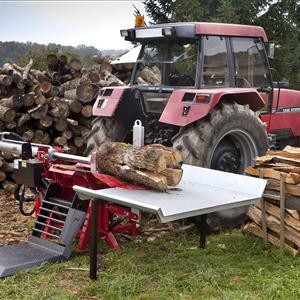 The hydraulically driven, 2.3 meter long conveyor transfers the firewood further from the splitting knife. Irrespective of whether you choose a tractor-powered, electrically powered or combustion engine-powered JAPA 305 model as your firewood processor, your firewood-processing experience will always be smooth, efficient and safe. The Japa 305 range is very mobile with Yard Tow, Off Road , and Road Tow options. Tractor hydraulics Oil Flow 30 l.p.m n.a. n.a. Electric motor, 4.0 kW 415V n.a. Standard n.a. Rights for technical modifications reserved. Warranty 1 year.